Parking Information: $6 - $16 Cash Only. Street & meter parking are also available. 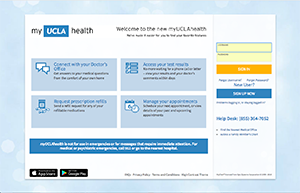 Get instant 24/7 access to your health information with myUCLAhealth. Ask about registration for myUCLAhealth during your next office visit. The Checkup is a new bi-monthly community newsletter to help UCLA Health patients live their healthiest lives. Find out about new office openings, read patient success stories and learn why primary care is important—and what preventive health screenings you may need.